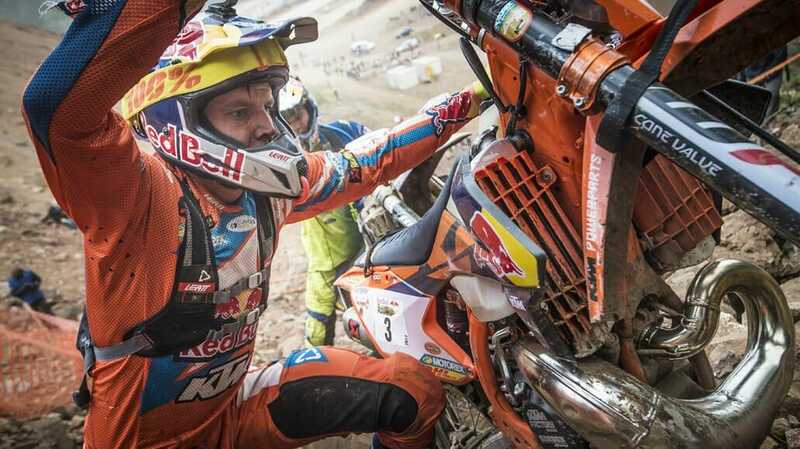 At the Red Bull Hare Scramble, the best Enduro riders in the world are starting. Hard Enduro, the name is program. – And the Erzbergrodeo is the hardest race in the complete Hard Enduro calendar. The route at the Erzberg has steep slopes, boulder fields and wooded areas. In the bathtub it is extremely steep uphill. Of course, on loose ground. Carl`s dinner is a very demanding gravel field. Green Hell is a forest part and the name is program. Jonny Walker (GBR) took over the lead shortly after the start. Wade Young (RSA), Cody Webb (USA) and Billy Bolt (GBR) followed. Alfredo Gomez (ESP) was able to move forward quickly and be on Walker’s heels. Young fell back to fifth place. At Carl’s Dinner, the gravel field, Gomez was able to pass Walker. Graham Jarvis (GBR), last year’s Erzberg winner, was also able to overtake Walker. Jarvis tried to defend his title, but Gomez remained in the lead. After only 2 hours and 17 minutes, Alfredo Gomez was the first to reach the goal. It is his second victory at Erzberg. In 2015 he could win here. Jarvis reached the target 3 minutes and 22 seconds later.